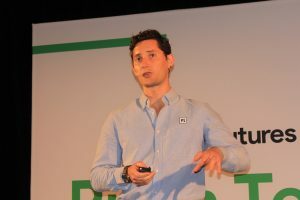 FARMLAB chief executive officer Sam Duncan began his pitch at the evokeAG conference in Melbourne yesterday with a smile and a simple message – we make soil testing easy. As one of several young agtech entrepreneurs seeking support in the conference’s Pitch Tent today, Sam is vying for a share in a $35,000 funding prize pool. But more than that he was seeking investment to support his global expansion plans to put farmers’ soil back into their hands by breaking down the barriers to undertake and maximise the value in soil testing. FarmLab CEO and co-founder Sam Duncan. Sam told the Pitch Tent judges and evokeAG delegates that the current soil testing system is “crap”, but FarmLab app could give farmers a clear indication of what is happening in their soil over the long-term and provide soil maps of farms that become assets in themselves. “That’s where we want to get to. He said the current soil-testing system is an old paper-based and expensive system that takes time. “Worst of all the data is really poorly digitised,” he said. Sam co-founded Farmlab with Shahriar Jamshidi as a simple mobile application for farmers and agronomists to order a soil test from a partner laboratory, arrange collection and testing parameters, and receive and interpret the results. “All of that data goes straight through to the platform and then we help them interpret it, turning those spreadsheets that we used to get into lovely digital soil maps for agronomists and farmers to better interpret and better manage their soil over the long-term. Sam said the majority of soil testing across Australia is conducted by agronomists and agribusinesses. FarmLab is releasing its mobile app in about two weeks with two lab partners East West Enviroag in Tamwworth and at Southern Cross University’s Environmental Analysis Laboratory at Lismore. A web app will be launched in a few months with features to improve the efficiency of soil sampling and digital soil mapping. Sam said a 10 percent administration fee is charged for every soil test that goes through the platform. “Keeping in mind we get wholesale prices through our labs, they are often about 20pc cheaper than what the consumer would pay the lab directly. “So we are still saving our customers money,” he said. The company has started shipping soil sampling bags – 20 last month – set to generate about $6000 in revenue. The business has been supported by about $625,000 in grant funding for projects with partners that include the University of Sydney. Although most soil testing is done by agronomists on behalf of farmers, Sam believes FarmLab can add value for farmers by storing data and privatising it within their accounts and databases.